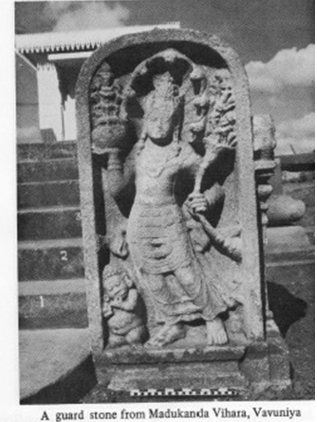 In his capacity as President of the Congress of Buddhist Associations of State Corporations & President of the Foundation for the Restoration & Protection of Buddhist Shrines in Sri Lanka as well as being the Minister of Industries & Scientific Affairs under the UNP Government, Minister C Cyril Mathew sent an appeal to UNESCO to safeguard and preserve the cultural property in Sri Lanka endangered by racial prejudice, unlawful occupation or wilful destruction. It was sent on 20 July 1983. 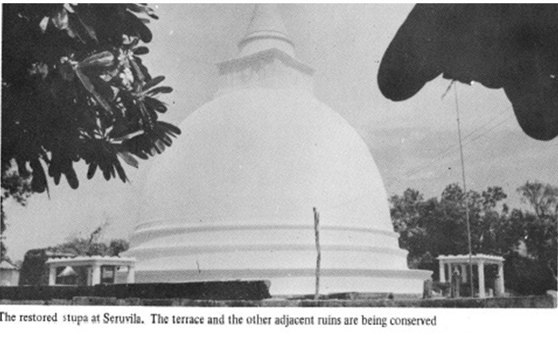 The Sinhala Buddhists owe gratitude to late Cyril Mathew for this report which clearly establishes that Sinhalese Buddhists were very much living in the North & East, Buddhist monasteries prevailed thousands of Buddhist stupas and architecture prevails and his report will reveal that if these remains are now missing the separatist elements among Tamils have purposely destroyed them and have built other structures on top of them in a cunning effort to nullify Sinhala Buddhist claims to North. However, these sites clearly invalidates any homeland claims by Tamils and should throw into the dustbin all notions being put forward that the North is the original homeland of the Tamils. Tamils have no historical right to claim a separate Tamil Homeland in the North. Sadly apart from Cyril Mathew we have yet to see present day politicians make an effort to nullify bogus notions that have been peddled over the years and accepted by the international public for lack of counter arguments. It is reports like these sent to proper authorities that can be used. We do not need political hysterics on stages anymore. We need the Sinhala Politicians to now stop their wailing which are only confined to the political stage for the next minute they are sipping tea with the very parties they had been shouting against. We also would like to see the historians, the academics who take salaries from the state come out to defend the nation by using their expert knowledge to refute and nullify the lies that are being used to establish a division of the country and a new constitution that would pave the way for a separate state. The ploy of asking for a little now and more later has worked well for the separatists for every year they have gained grounds riding on lies and well-funded campaigns while the Sinhalese leaders and parties that should come forward have kept silent. 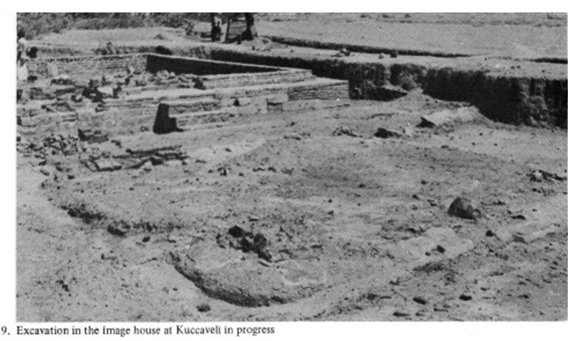 Looking at the photos taken in 1983 of the remains of ancient sites is sad that people have stooped so low to destroy ancient artefacts that present day engineers cannot even dream of constructing. These were built without any educational qualifications or PhDs. It should be made an indictable crime to destroy such and action must be taken against any religious party or organization that attempts to build their religious structures over these ancient remains as we see taking place even now. Prof. Kartigesu himself said that Tamil settlements in the North was established only after the middle of the 13th century. Selective picking of dates and time periods overlooking the fact that Sinhalese have more right to claim the North does not give any basis for TNA or its Chief Minister to make any demands whatsoever. The Sri Lankan Government and the International Community are doing injustice to the Sinhalese who built the nation by using lies to carve out or devolve powers with later intention to create a separate nation. Please note these are just a handful of examples to showcase that the Sinhalese were living in the North very much before Tamils arrived from South India. Sinhalese cannot colonize their own land! · Remains of ancient stupas, ponds, monastic buildings, image houses and other architectural embellishments scattered in a large area on a hillock. · Kurundapasana vihara built by King Khallatanaga in 2nd century BC where Sinhalese commentary called ‘Kurundi Atthakatha” was written. 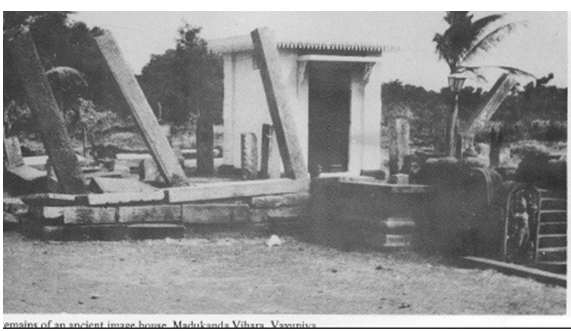 · The Kurundi vihara was 78 acres, covered 2 roods and 13 perches in extent. 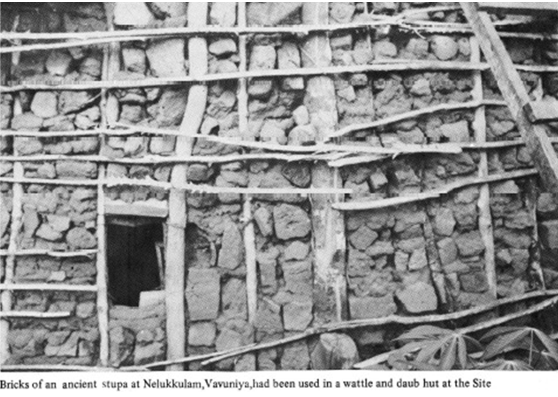 · The communal disturbances in August 1981, during state of emergency individuals had entere the archaeological reservation without permission & constructed a tiled roof on the remaining stone pillars of an ancient image house with the intent of converting it to a modern Hindu kovil. A section of the floor inside the image house was concreted and cemented and a trident planted. · The stone slab placed before the trident to light camphor was a sacred foot print stone of the Buddha. 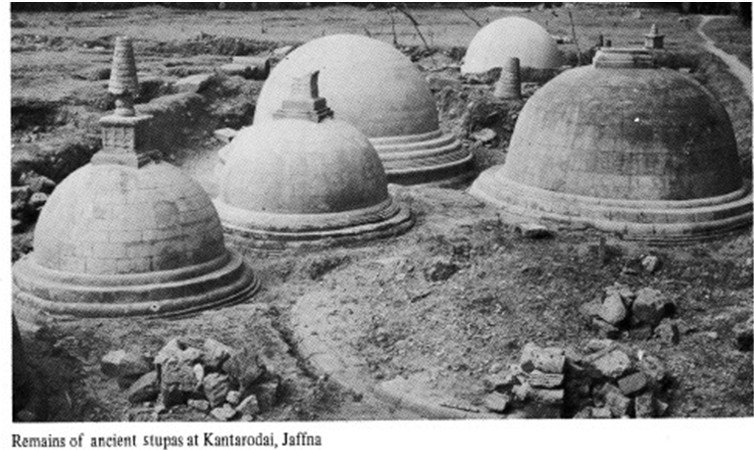 · Summit of the adjacent stupa mound had been levelled and cemented also to construct a Hindu kovil. 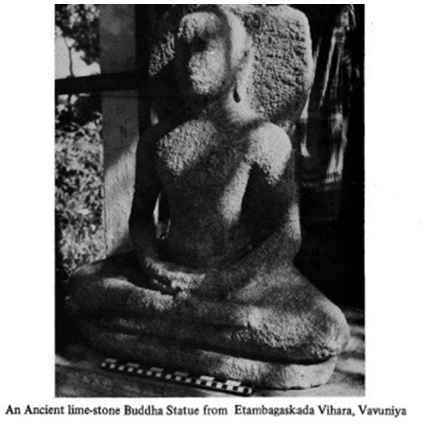 · This constituted another violation of Buddhist sites in Sri Lanka’s North that existed since 2nd century BC. 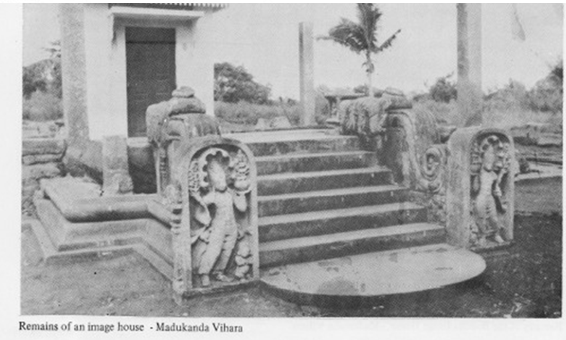 · Ancient site in village of Samalankulam in Vavuniya District containing remains of 2 stupa mounds and an image house belonging to Anuradhapura period. 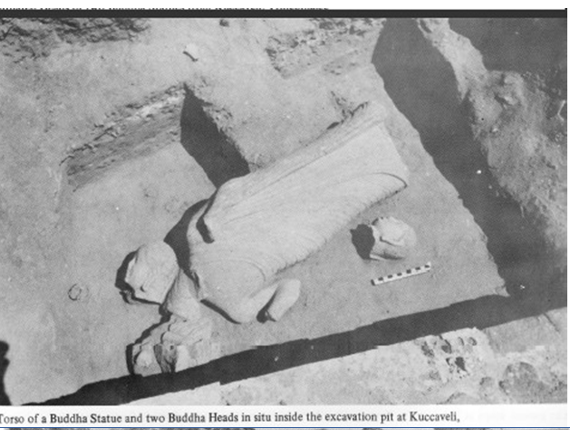 · Statue of Avalokitesvara Bodhisattva and a fragment of a Buddha Statue discovered during excavations and conservation of image house by Dept of Archaeology. · Excavations revealed constructions of 2 periods at the site. 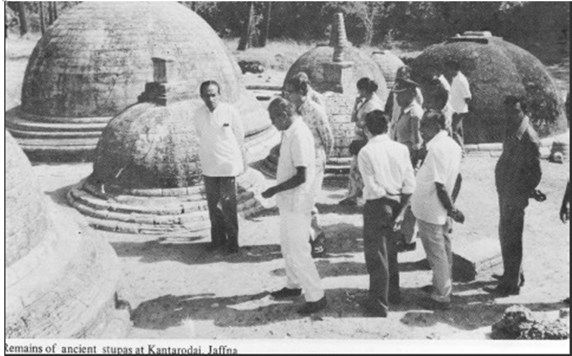 · However a modern Hindu kovil was being constructed at site. 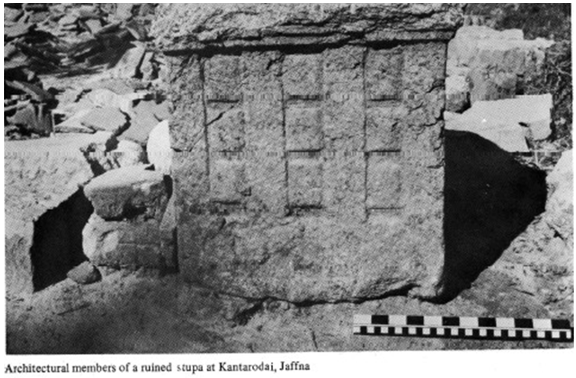 · Damage had been done to the site and archaeological work was done with much opposition. 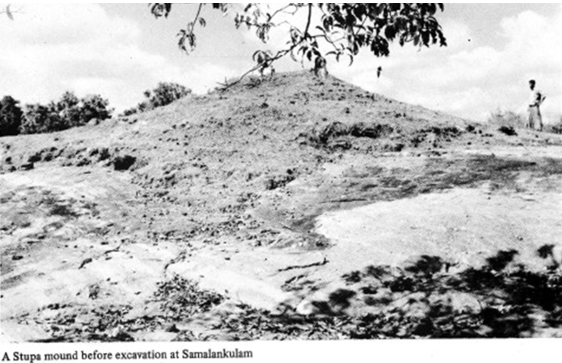 · Stupa mound 30ft in height in Vavuniya was destroyed, levelled and cemented and trident put. · A few yards from the stupa are remains of a structure with standing stone pillars identified as monastic building of ancient Buddhist monks. · West of the Bodhi tree are pieces of sculpture, stone pillars and brickbats scattere. · Ruins belong to a period before the Anuradhapura period. · A modern Hindu kovil constructed in front of site within the ancient vihara premises which still contains Bodhi tree and a foot print stone. 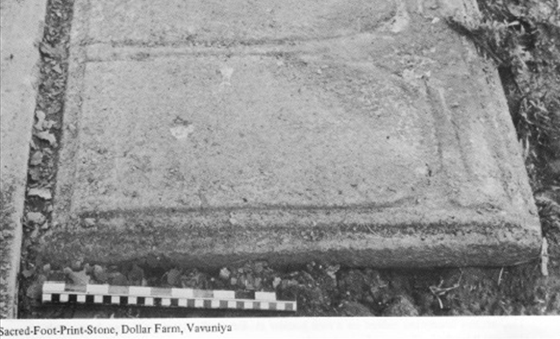 · Sacred foot print stone indicates site was in active religious worship since beginning of the Christian era. 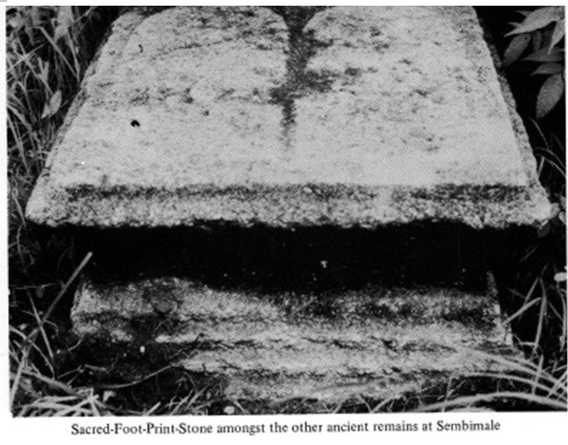 · Remains belong to Anuradhapura period. · Planted in 3rd century BC by King Devanampiyatissa. · According to Dhatuvamsa (Sinhalese text) of the 14th century the Bo Tree belonged to Mangala Maha Stupa of Seruvila erected by Kavantissa, father of King Dutugemunu as per wish of the Buddha. · However, the Sri Wardhana Bo Tree was actually planted before the erection of the Stupa by King Kavantissa in the 2nd century BC. · According to Bodhivamsa (Sinhalese text) which gives the history of the Great Bodhi Tree at Anuradhapura, the Sri Wardhana bo tree was one of the original saplings that grew out of the first five berries that appeared on the Bo Tree in Anuradhapura. This makes Sri Wardhana Bo Tree second to Great Bo Tree in Anuradhapura in terms of its sanctity and antiquity. · On 4 Nov 1957 under the Village Committee Ordinance (Sec 40) the land on which the Sri Wardhana Bodhi Tree (Kiliveddi) of Seruvila stood was veste in Mallikativu Village Committee. 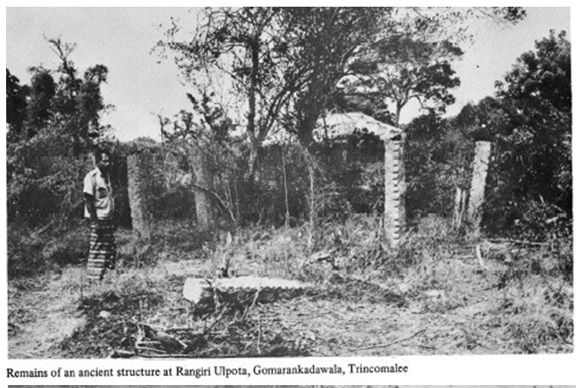 · It was in 1970 on orders by a Federal Party (ITAK) MP that branches of this sacred Bo Tree was cut on the excuse to provide telephone line to the residence of Thangadorai, another ITAK MP. 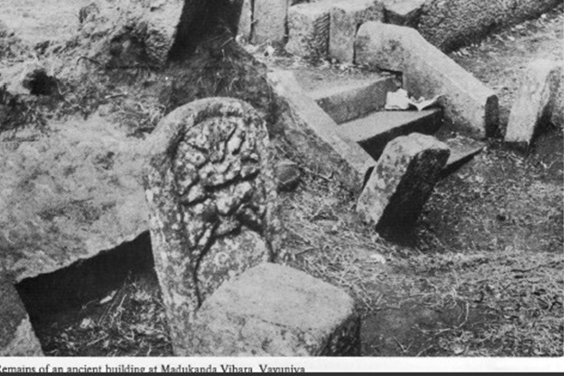 The Chief incumbent of the Seruvila Mangala Rajamaha Vihara & Chief High Priest of the Tamandaku East brought this to the attention of PM Sirimavo, GA Trincomalee, Commissioner of Archaeology but nothing was done. · The ACBC made a complaint to the Minister of Posts & Telecommunications Mr. Kumarasuriyar against the ITAK MP for Muttur Mr Thangadorai who got the workmen from the Telecommunications Dept to cut the branches. The Minister wrote to the ACBC on 23 Jan 1971 expressing his deep regret. 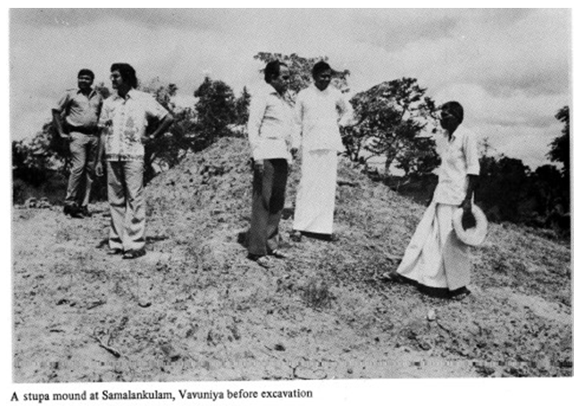 · In 1971 M H Sirisom the Assistant Commissioner of Archaeology went with Hon. Min of Cultural Affairs to inspect site and reported there was no wall around the land on which the Bo Tree stood and that work was under way to erect a Kovil in the adjacent land. · Minister of Justice Dr. Nissanka Wijeratne visited the Kiliveddi Bo Tree in Seruvila with S S Kulatillaka Minister of Cultural Affairs and reported that he sensed a plan to destroy the Bo Tree by non-Buddhist vandals and that instructions were given to officers of the Archaeological Dept to guard the place. 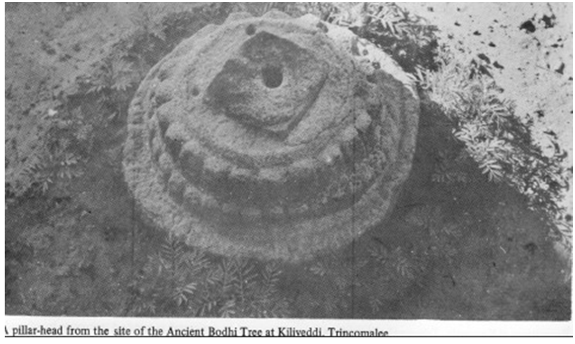 · The Government Agent of Trincomalee Mr. Eric J de Silva reported to the Superintended of Police, Trincomalee Mr Y D Senerat that he was notified of branches of the Bodhi Tree been cut on 2 August 1976 and the plan was to cut more branches with the intention to totally destroy it. A tense situation was arising among Sinhala Buddhists in the area. · The GA Mr. Eric de Silva had been told by Mr. Thangadorai over the telephone that ‘if the Bodhi Tree stoon on the land of the Kovil what they do with it is the responsibility of the people to whom the Kovil belongs”. 2 days later when the GA visited the site, there was only a 10ft stump of the sacred Bodhi Tree which had been venerated by Buddhists for thousands of years. · Given the explosive nature of the situation, the chief incumbent of the Seruvila Mangala Rajamaha Vihara lodged a complaint to the Headquarters Inspector of Muttur Police Mr. B M S B Basnayake. The Muttur Police filed action on 12 August 1976 charging not against the destruction of a place of worship but a land dispute. The case was put off due to the Non-Aligned Conference being held. The case was retaken on 1 April 1977 but the case was dismissed. 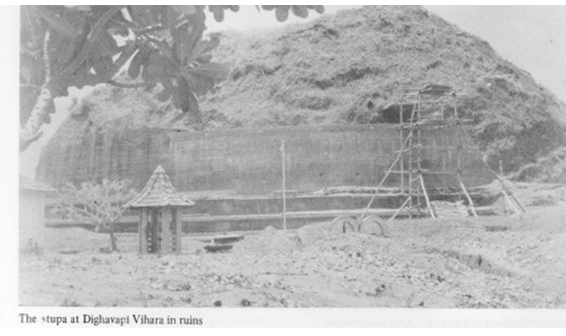 · The GA visiting the Bodhi Tree site on 4 April 1977 found that even the main trunk had been destroyed. What is noteworthy is that while the case was filed and after its dismissal the entire Bo Tree had been eradicated. · The age venerable nayake thera of Seruvila struck with grief sent letters to the President, the PM, Minister of Cultural Affairs, IGP, GA, Commissioner of Archaeology and the Head Quarters Inspector of Muttur. 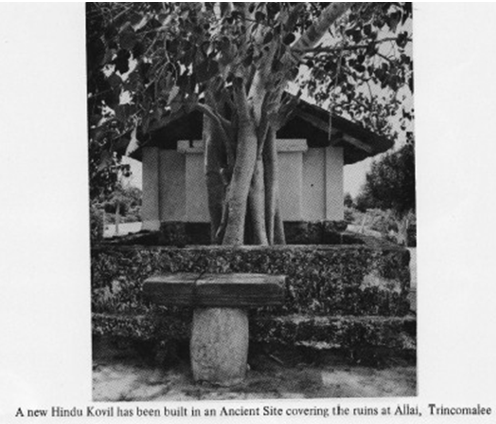 · After change of government in July 1977, it emerged that an unlawful construction of a new Hindu Kovil had commence on the site where the historic Bodhi Tree stood (there were now 2 Hindu kovils). All evidence of the existence of the Bodhi Tree had been obliterated. · The premises of the Bodhi Tree containing ruins of stone pillars that came under the Village Committee of Mallikativu in 1957 had violated the statutory provision honoured since 1815. 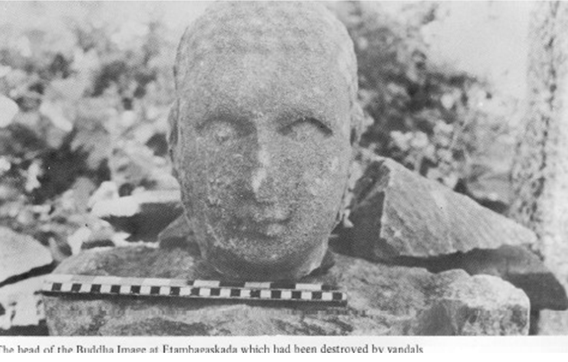 · Between 1970-77 a calculate scheme was executed to destroy the Bodhi Tree, obliterate the ruins of the Bodhighara and reduce the shrine to bare land. The Sirimavo Govt took no steps to safeguard it and failed to uphold the constitution which undertook to ‘safeguard and protect Buddhism’. · A memorandum was submitted the President by the Seruvila Sacred City Development Society on 27 June 1979. 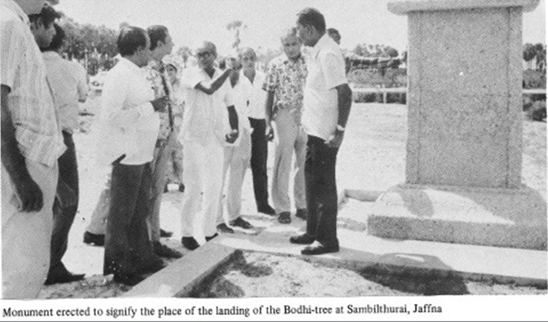 A Presidential Order was given that the land on which the Sri Wardhana Kilivedda Bodhi Tree stood was to be taken over by the Dept of Archaeology on 29 Nov 1979 as an archaeological reserve. 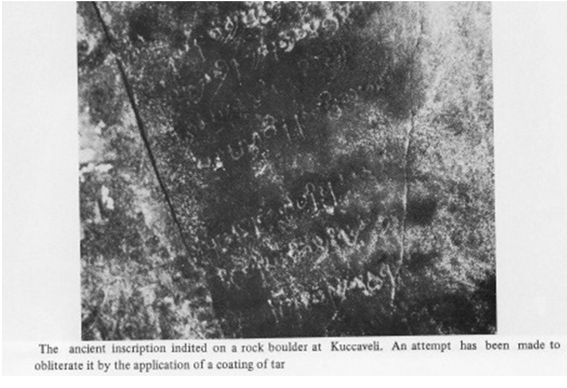 · Dr. E Muller in his ‘Ancient Inscriptions of Ceylon’ writes this is a solitary rock close to the sea which bears a fragment of an inscription in the characters of the 7th century. 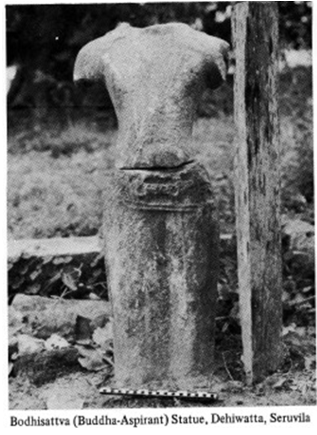 The country is now inhabited almost exclusively by Tamils, but at that time it must have been Sinhalese as we can see not only from this inscription but also from the remains of a Buddhist temple found at Nattana Kovil about 3 miles west of Nilaveli (8 miles from Trincomalee) and close to the bund of Periyankulam tank”. · Situated a few miles from Kuccaveli contains remains of extensive Buddhist monastic establishment dating to early Anuradhapura period. · Remains of large stupa mounds, sacred foot-print-stones, monastic buildings and Buddha images can be seen at site. 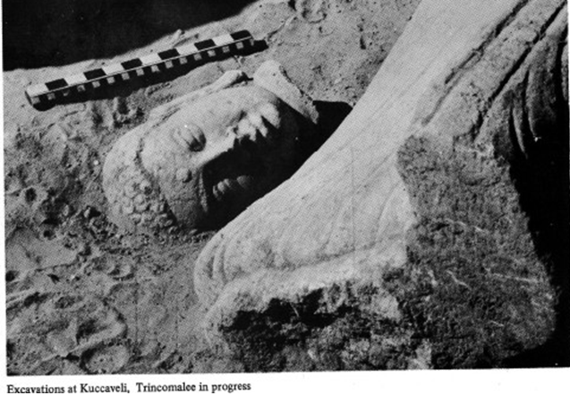 · A large Buddha statue 8ft in height was seen in the beginning of Oct 1978 when the GA Trincomalee visited. It was missing when the District Revenue Officer of the area went to visit the site on 25th Oct 1978. 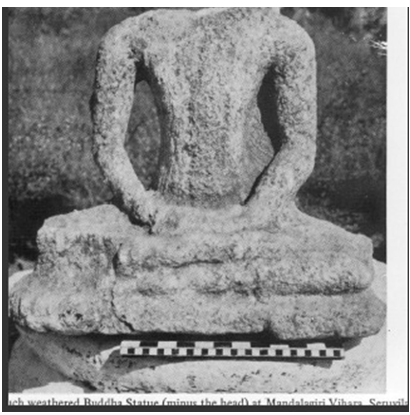 · The statue was subsequently recovered by Archaeological Officers 6miles away from Sembimalai near a modern Hindu kovil. 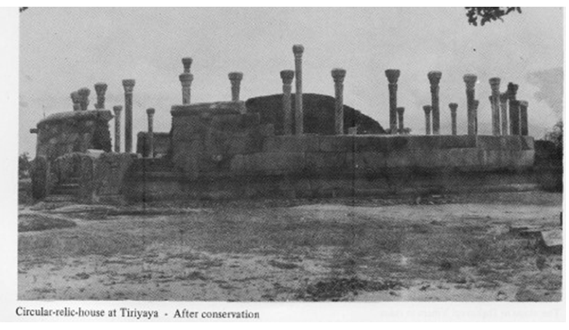 · Excavation at the site exposed remains of 2 early stupas which are being conserved by the Archaeology Dept. 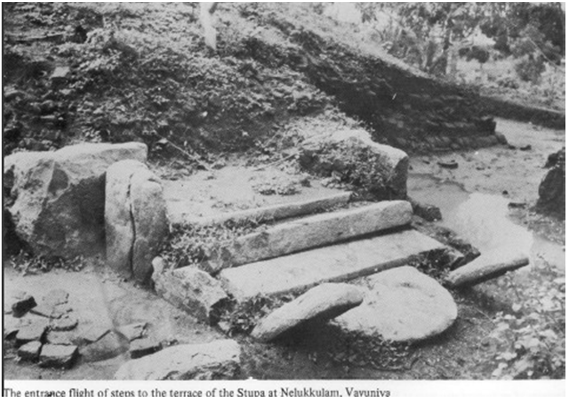 · The ancient foundation of the vihara extends beyond the new Hindu kovil. · A 1st century AD rock inscription discovered at site gives the name vihara. 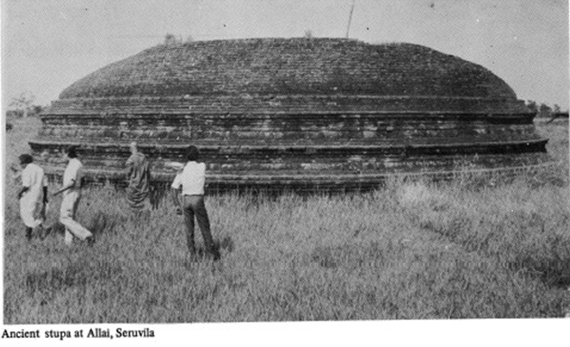 · Site contains a stupa mound dated to Anuradhapura period. · Entire site is replete with ancient brick-bats and other ruins dated to 3rd century BC-6th century AD. 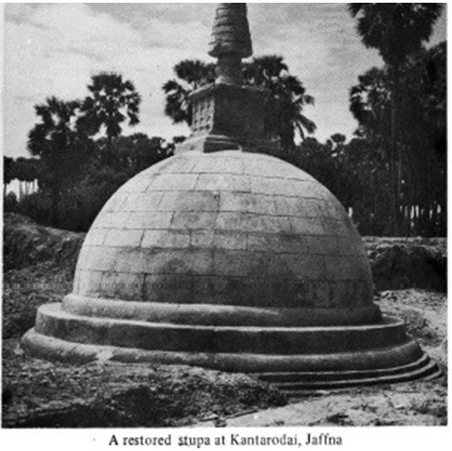 · Site had been occupied by non-Sinhalese and occupants had converted site to a farm and a well had been dug cutting through the stupa to provide water. · Land containing the ruins are 10 acres and declared an archaeological reservation. · Pulukunawa is situated in the village of Pulukunawa in Eruvil Porathivu and Manmunai AGA’s division in the district of Batticoloa. · Pulukunawa archaeological reserve is a large forested hill with large numbers of dripledged caves. These caves have inscriptions which record the donation of the caves of Buddhist monks. · The flat area below the hill are remains of ancient structures. · Site inspected on 15th Jan 1982 by Asst Commissioner of Archaeology – ruins on the hillock had been disturbed by unauthorized chena cultivation. · Stone pillars have been removed while attempts made to remove other pillars and spur stone. 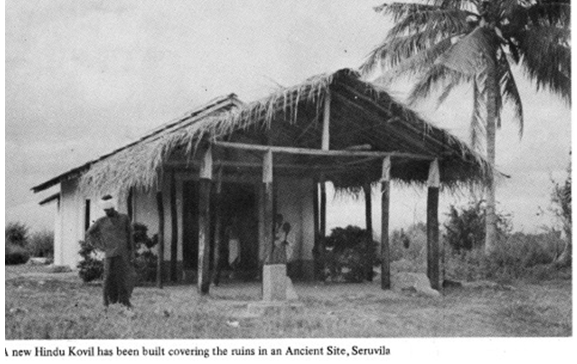 · Site situated about 8miles beyond Pulunkunawa towards Batticoloa jungle. · The rocky area beyond pond can be seen 3 double-platform buildings and remains of several ancient structures belonging to 7th, 8th centuries AD. · Site can be approached from Kanchankudi junction on Akkaraipattu Pottuvil road. 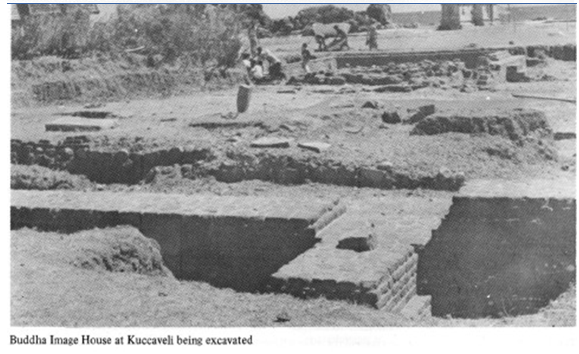 · Site surveyed in 1974 and to be declared archaeological reserve and delay in handing over to Archaeological Dept because relevant files have gone missing from the Ampara Kachcheri. 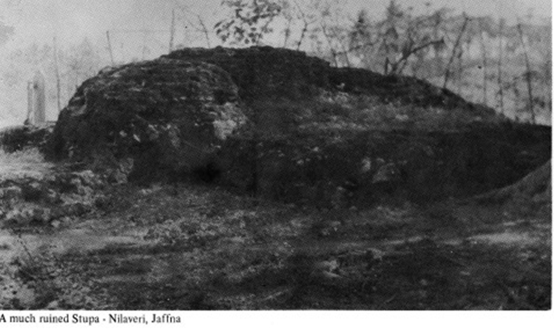 · Remains of 2 hillocks on either side of tank bund with ancient stupa mound 20ft in height. · 11 excavated caves contain pre-christian Brahmi inscription recording gift of the cave and tank to Buddhist monks which means a forest monastery existed at the site. · At present a modern Hindu kovil is found at site. 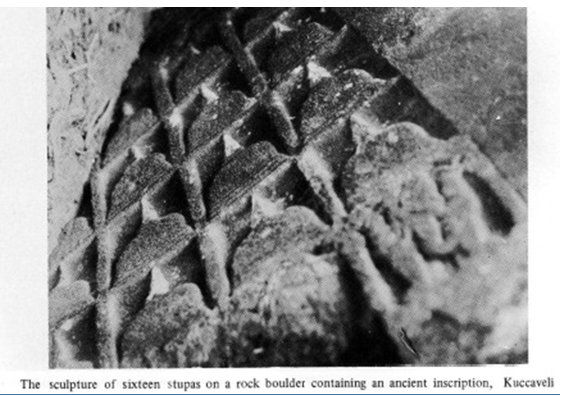 · Site has a beautiful footprint of Buddha carved on a rock boulder. · Number of ancient buildings at site denotes Buddhist monastic establishment. · 3 miles from Pottuvil-Akkaraipattu main road is Sangamankanda are remains of a few ancient stupas and monastic buildings. · These ruins are remains of an early monastic establishment belonging to early Anuradhapura period. 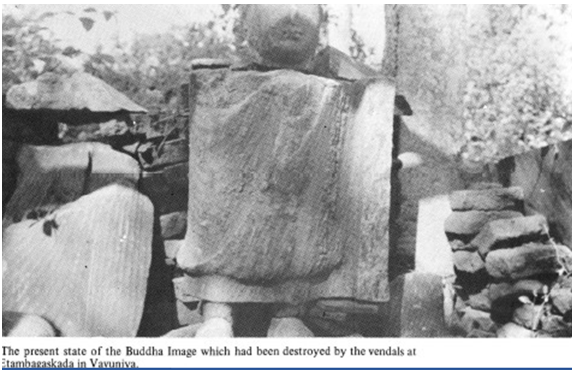 · Non-Buddhists occupying area pose a threat to existing ruins at site. 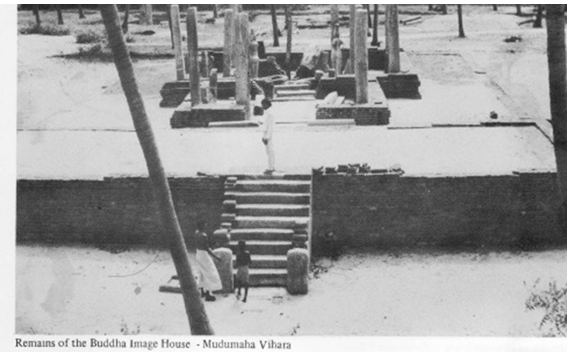 · Yupa stone (stone pillar of the stupa) indicates stupa belongs to earliest phase of stupa construction in Sri Lanka. · Vast ancient monastic complex containing remains of several stupa mounds and image houses. · Ancient caves with dripledges which were monastic cells of Buddhist monks and natural water holes on the extensive rocky area bespeaks the antiquity of the place going back to the time Buddhism was introduced to Sri Lanka in the 3rd century BC. 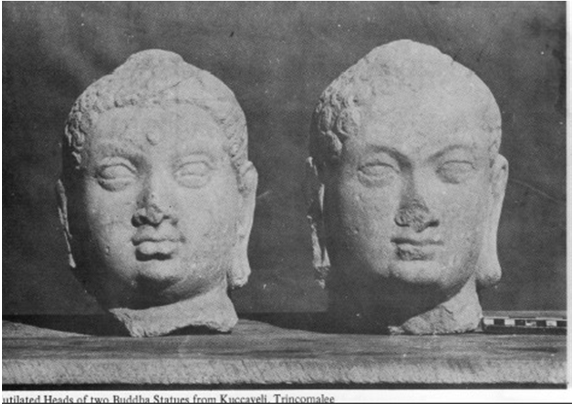 · Buddha statues and other objects of antiquity and religious worship are missing from site. · Situated in the vicinity of the tank called Omandiamadukulam on Trincomalee road from Valaichchenai in district of Batticoloa. 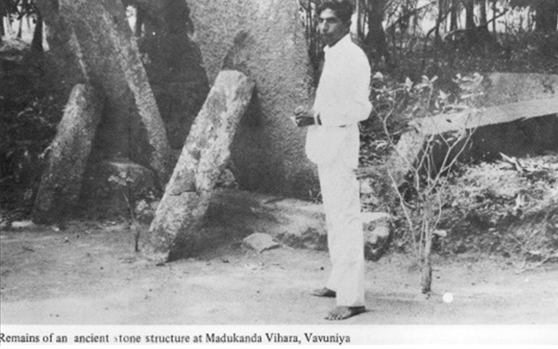 · Plain guard stones and moonstone at site has been removed and is now used as an alter stone at a modern Hindu kovil. Removal has caused guardstone and few steps to be broken and damaged. · Bricks of ancient stupa used for the construction of a modern house too. · Situated 3 miles from Pottuvil in Amparai district. 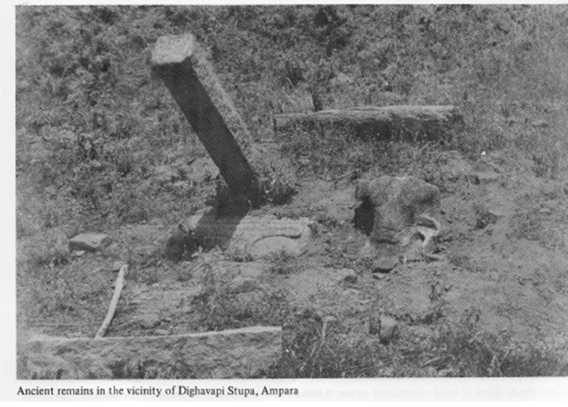 · By the side of the stupa mound are few stone pillars and ruins which extend to adjoining lands. · Ancient sea-port called Lankapatuna are remains of an ancient stupa and image house. · Place was sanctified by landing of Prince Kalinga who brought the sacred Tooth-Relic of Buddha to Sri Lanka in 3rd century AD. · Ancient port and port city at the place. 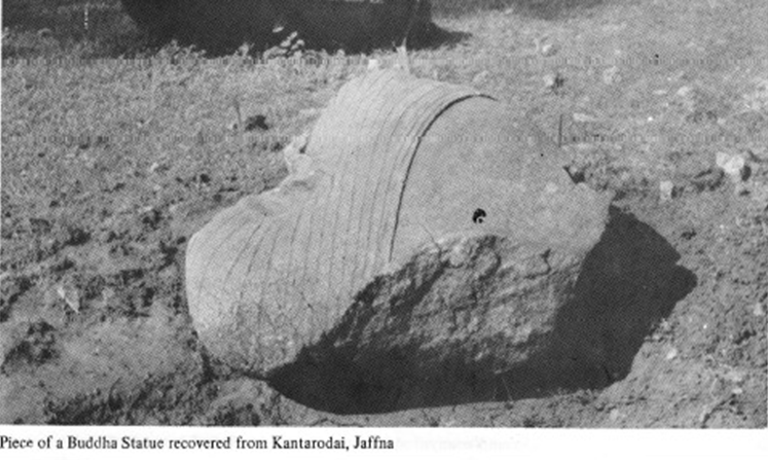 · Moonstone slabs, lotus pedestal stones and other antiquities found in abundance at site. 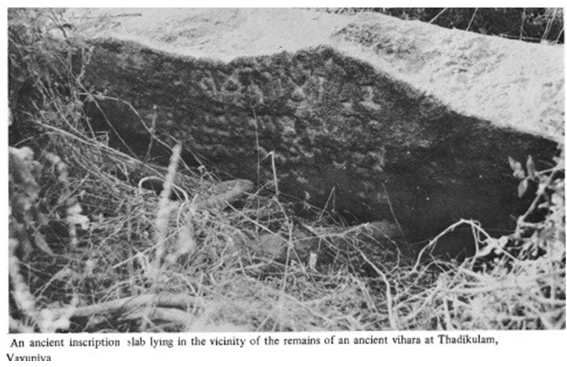 · Several pre-christian Brahmi (ancient Sinhala) inscriptions and about 150 ancient sites with visible Buddhist remains discovered in the area is evidence that Sinhalese Buddhist settlements prevailed in Trincomalee at least since 2nd century BC if not from 5th century BC. · The writings of Portuguese historian De Queroz mentions of Francis Xavier trying to convert a Buddhist monk who was chief incumbent of the Vihara built by King Mahasena. This proves that a Buddhist monastery existed continuously upto the 17th century till it was destroyed by the Portuguese to build the Fort at Trincomalee. Shenali Thanks for a great article. Sinhalese never allowed Indians to settle and set up their own administration in the island nation. Now the Indian Union with the help of Indian colonial parasites and vermin overseas they want to get hold of the island. Thank you Shenali. This changed my view about Cyril Mathew who is portrayed as a rioter and nothing else by Tamils. Now it is clear why he was so branded by Tamils. Cyril Mathew must be thanked for this daring and ground-breaking work. Destruction and converting to Hindu shrines are the tactics used by Tamils in relation to these. If unable to do so, they claim these are remains of Tamil Buddhism. It is an argument which is difficult to prove wrong. However, one thing is certain that these are Buddhist shrines and must belong to Buddhists, not Tamils. Cyril Mathew, was and is a national hero. Indian government force JRJ to remove him. Dilrook at least you have woken up. I remember Cyril Mathew as a lone voice of Sinhalya in the UNP government. “Tamil Buddhist”, if any, should be the Sinhalse who were forcibly converted to Tamils as per Nalin’s analysis. May be Dharmasiri could give some details. THank you Shenali very much for this illuminating article. It’s really interesting that this was submitted to UNESCO by Cyril Mathew about 4 days before the July 1983 riots. Dilrook, growing up I have always heard that Cyril Mathew was the major force behind the Riots. I have posted this previously. But pasting again as it is relevant to the subject. This one is from Divayina . This is something happening right now. වට්‌ටමඩු ප්‍රදේශයේ වසර දෙසීයක්‌ පැරණි මුස්‌ලිම් ජාතිකයෙක්‌ගේ සොහොන් තිබෙනවා. එතන අපේ ගල් කණුත් තිබෙනවා. දැන් එතන පල්ලියකුත් හදලා අලුත් ගම්මානයක්‌ හදන්න යනවා.” අයෙක්‌ මට කීවේය. අසන්නට ලැබුණු තොරතුරු කුහුල දනවන සුළුය. මම මා ප්‍රිය මිතුරු සමන් සමග ඒ සොහොන සොයා ගියෙමි. අක්‌කරපත්තුව නගරයට පිවිසි අපි සාගම පොතුවිල් මාර්ගයේ ඉදිරියට ගියෙමු. ඩෝසර් කර බිමට සමතලා කරන ලද මොට්‌ටයාගොල ඉපැරණි පුද බිමද පසු විය. දෙපස කෙත්වතුය. ප්‍රධාන මාර්ගයෙන් වනපෙත දෙසට යනවිට සාගම වැව හමුවේ. වාහනයකට තබා පාපැදියකටවත් යාමට අපහසු මෙම මාර්ගයේ ගමන අතිශය දුෂ්කර විනි. ”මේ තියෙන්නේ මෙතන දාගැබක්‌. අර පේන තැනත් දාගැබක්‌, අර තියෙන්නේ ගල් කණු. අන්න අර හරියේ කවදාවත් හිෙ`දන්නේ නැති ක`ඵ දිය පොකුණක්‌ තිබෙනවා.” සමන් අවට වූ නටබුන් ගොඩැලි පෙන්වමින් යතුරුපැදිය පැදෙව්වේය. දෙපස පාළුය. තවත් දුර යනවිට හමුවන්නේ කලෙක කුඹුරු වගා කර අත් හරින ලද ඉඩම්ය. තැන් තැන්වල පෙර දිනයේ අලින් දැමු අලි වසුරුය. ”හැන්දෑවෙනකම් හිටියොත් අලි එනවා. සමහර වෙලාවේ දවල්ටත් අලි එනවා.” සමන් යළිත් හ`ඩ අවදි කළේය. ල`දු කැලෑවන් සහ ක`දු වැටි අතරින් හතර අතට වැලි පාරවල් පෙනේ. අප මහා මාර්ගයේ සිට මිනිස්‌ පු`ඵටක්‌ නැති අතුමග දිගේ කිලෝ මීටර් හත අටක්‌ පමණ පැමිණ තිබිණි. අප සොයා යන්නේ වසර දෙසීයක්‌ පැරණි ශ්‍රී ලාංකික මුස්‌ලිම්වරයකුගේ සොහොනකි. එම හැ`ගීම අප තුළත් යම් කුතුහලයක්‌ දනවයි. මේ අප සමග සියවස්‌ කාලයක්‌ එකට ජීවිතය බෙදාගත් මිනිසුන්ගේ සාධකනම් එය කොපමණ අසිරියක්‌ ද?. අවසානයේ වසර දෙසීයක්‌ පැරණි යෑයි කියන සොහොන හමු විය. එය තිරුක්‌කෝවිල් ප්‍රාදේශිය ලේකම් කොට්‌ඨාසයේ ආරච්චිකට්‌ටුව ප්‍රදේශයේ පිහිටා තිබුණි. දෙපස ඉපැරණි ගල් කණු දෙකකි. එය යාකොට සිමෙන්ති ගඩොලින් බ`දින ලද සොහොන් ගැබ යෑයි කියන ස්‌ථානයට ඉහළින් කොළ පැහැති රෙදි හා කොඩි වැල් ඇද තිබිණි. ඉදිකිරීම හතර අත නිවීගිය හ`දුන්කුරු කොටස්‌ තිබුණි. සොහොන් කොත යෑයි කියනා ඉදිකිරීමේ සිමෙන්ති වලින් වට කළ කොටසේ එක්‌ පසෙක වතු සුද්ද පඳුරු කිහිපයක්‌ විය. අඩි 10ක්‌ 12ක්‌ උසට වන්නට සැකසු ස්‌මාරකයක්‌ද පසෙකින් තිබිණි. තහඩු ගසා ලෑලිවලින් මෑතකදි කරන ලද පල්ලියක්‌ද එම භුමියේ වූයේය. සියල්ල පැහැදිලිය. මේ පවතින්නේ අනුරාධපුර යුගය තෙක්‌ දිවෙන පුරාණ ආරාමික නටබුන්වලින් උගුල්වාගත් ගල් කණු ය. මේ බෞද්ධ ආරාමික නටබුන් උගුලුවා ඒ ආශ්‍රයෙන් ඉදිවෙමින් ඇති මුස්‌ලිම් පල්ලිය බොහෝ අසුබ ඵල අනාගතයට ගෙන එනු ඇතැයි සිතේ. මේ රටේ පැවැත්ම සහතික වන්නේ එකිනෙකා එකිනෙකාගේ සංස්‌කෘතියට එහි හරයන්ට ගරු කිරීමෙන් පමණි. එහෙත් මේ මුස්‌ලිම් සහෝදරවරු මහා ව්‍යසනයක්‌ අපේක්‌ෂාවෙන් අශ්ලීල ප්‍රවේශයකට එළඹ සිටිති. කූරගලට සිදුවූයේත් මෙයමය. මේ පුංචි විඥානයක්‌ සහිත පරිණත නොවූ මිනිසුන් නැගෙනහිර බොදු උරුමය විනාශ කිරීමටත් එම උරුම සංකේත මුස්‌ලිම්කරණය කරගෙන අර්ථ දක්‌වන්නටත් කළ උත්සාහයේ මුල්ම අවස්‌ථාව මෙය නොවේ. පවතින රජය මෙවැනි සංස්‌කෘතික ව්‍යසනයන් නැවැත්වීමට නෛතික පදනම ශක්‌තිමත් නොකරන්නේනම්, පුරාවිද්‍යා දෙපාර්තමේන්තුව මේ ව්‍යසනයට ශාස්‌ත්‍රීයව මැදිහත් වී මේ බිම ස`දහා අර්ථකථනයක්‌ නොදෙන්නේනම් එය අවසන් විය හැකි ෙ€දවාචකයේ තරම අපට දැන් වැටහෙන්නේය. මෙතැන ඇත්තේ මුස්‌ලිම් ජාතික ශුද්ධවරයකුගේ සොහොනක්‌ නම් එය පුරාවිද්‍යාත්මකව සිදුකළ යුතු වටිනා සොයාගැනීමකි. අවට පුද්ගලයන් පවසන්නේ මුස්‌ලිම් ආගමික නායකයෙක්‌ ලෙස හ`දුන්වන බාවා නමැති පූජකවරයාගේ සොහොන මෙය බවය. එහෙත් අපට පෙනෙන්නේ අඩුම තරමින් වසර දහසක්‌ පැරණි ආරාමික නටබුන් විතැන් වීමක්‌ය. මෙම ස්‌ථානයට මීටර් දෙතුන් සියයකට එපිටින් වන වදුලෙන් වටව ගල් තලාවක පොතාන ඉපැරණි පුදබිම ඇත්තේය. එම ක`දු පර්වතය මත සාහසිකයන් විසින් විනාශ කරන ලද ඉපැරණි දාගාරී ගොඩැල්ලක්‌ය. වන පෙතට කිලෝ මීටර කිහිපයක්‌ ඔබ්බෙන් ඇත්තේ මාන්තොට්‌ටම ප්‍රදේශයය. එක්‌ පසෙක එදා කොටින්ගේ පරාදීසයක්‌වූ කංචිකුඩිආරු වනපෙතය. පෙනෙන මානයේ තැන් තැන්වල ගල්කණු සහ පියගැට පෙළවල සලකුණුය. අතීත බෞද්ධ උරුමයේ සාධක විනා වසර දෙසීයකට එපිට මිය ගිය මුසල්මානු ශුද්ධවරයෙකුගේ සොහොනක්‌ පිළිබ`ද සාධනීය තොරතුරු අපට පෙනෙන්නේ නැත. අප එන අතරමග සාගම ප්‍රදේශයේදී හමුවූ අක්‌කරපත්තුව පදිංචි එම්. එච්. එම්. මොහොමඩ් මේ ස්‌ථානය ගැන කී කතාව සිහිවේ. ”මම කුඩා කාලයේ ඔතනට ගිහිල්ලා තියෙනවා. එතන සොහොන් ගැබක්‌ තිබිලා තියෙනවා. ඒ සොහොන් ගැබ තිබෙන්නේ පල්ලියට අයිති භූමියේ. එතන පූජක කෙනෙක්‌ ඉ`දලා තියෙනවා. එයාගේ සොහොන තමයි ඒ.” මොහොමඩ්ගේ කතාව කුහුල දැනවීය. මෙම ස්‌මාරක සහිත ප්‍රදේශයට මදක්‌ ඔබ්බෙන් කූඹුරක සී සාමින් සිටි දමිළ වැසියන් කිහිප දෙනෙකු අපට තොරතුරු කියන්නට ඉදිරිපත් වූහ. මුලින්ම කතා කළේ අක්‌කරපත්තුව පදිංචි ඉලේතම්බි රාඡේන්ද්‍රන්ය. අනතුරුව අපට කතා කළේ ආලයඩිවෙම්බු එන්.රඝූපතිය. ”සිකුරාදට මෙතන තියෙන පල්ලියේ ජූජාවන් තියෙනවා. එතෙනට කිලෝ මීටර් 07ක්‌ 08ක්‌ දුර ඉ`දන් කට්‌ටිය එනවා. මුස්‌ලිම් ගම්මානයක්‌ එතන කලින් තිබ්බේ නැහැ. එතන කැලෑව තිබ්බේ. මේ අය එවා එළි කරලා තියෙනවා. මම අවුරුදු 10 ඉ`දන් තමයි මෙහි ආවේ. නමුත් ඉස්‌සර මෙතන මුස්‌ලිම් ගම්මානයක්‌ තිබ්බේ නැහැ. මේ ඉඩම් වගා කරන්න ගත්තේ පන්නල්ගම වැව හැදුවට පස්‌සේ.” යනුවෙන් රඝූපති කීවේය. අක්‌කරපත්තුව සිංහල සංවිධානයේ ලේකම් එච්. සමන් කිවේ මෙවැනි කථාවකි. දිගාම`ඩුල්ල බෞද්ධ උරුමයන් රකින්නට මහත් වෙහෙසක්‌ ගන්නා අරන්තලා ජත්‍යන්තර බෞද්ධ මධ්‍යස්‌ථානාධිපති, අම්පාර විද්‍යානන්ද පරිවෙණාධිපති ශාස්‌ත්‍රපති පූජ්‍ය කිරිඳිවෙල සෝමරතන නාහිමියෝ මේ විපරිතය පිළිබ`ද අදහස්‌ පළ කළ අයුරු සිහිවේ. ”ඔය ප්‍රදේශය ඇතුළුව නැගෙනහිර ප්‍රදේශය පුරාම සෑම තැනම ගව්වෙන් ගව්ව විසිරී තිබෙන්නේ අපේ බෞද්ධ උරුමය. කොච්චර විනාශ කළත් අදටත් එම ප්‍රදේශයට යන අයෙකුට තවමත් ඒ අතීත උරුමයන් දකින්නට හැකියි. කොච්චර ගල් බෝර ගැසුවත්, කු`ඵ ගෙඩි පහරවල් ගැසුවත් තවමත් ඒ අතීත උරුමය අපේ වාසනාවට මෙන් විනාශ කරන්න බැරි වෙලා තියෙනවා. ක`ඵ ගලෙන් ජීවමාන බුදුරුව නිර්මාණය කළේ බෞද්ධ කලා කරුවන්, අපේ ඉපැරණි පුද බිමක්‌ ආසන්නයේ තිබෙන ගල් කණු උපයෝගි කොට ගනිමින් වසර 200 ක්‌ පැරණි මුස්‌ලිම් ජාතිකයෙකුගේ පුදබිමක්‌ තිබෙන බව කියනවා. මේ හැසිරීම කනගාටුදායකය. මෙම ස්‌ථානයේ ගල් කණු පිටතින් රැගෙනා ආ ඒවාද? එසේ නොමැති නම් මෙම ගල් කණු එම ස්‌ථානයේ තිබුණු අපේ උරුමයන්ද? සැබවින්ම මෙම ස්‌ථානයේ වසර 200ක්‌ පරණ මුස්‌ලිම් ආගමික නායකයෙකුගේ මළ සිරුරක්‌ තිබෙනවාද? එසේ තිබෙන්නේ නම් කොපමණ කාලයක්‌ පැරණී සිරුරක්‌ද කියා අපි පුරා විද්‍යා දෙපාර්තමේන්තුවෙන් පරීක්‌ෂණයක්‌ ආරම්භ කරන්න කියලා අපි ඉල්ලා සිටිනවා. අන්තවාදි කොටස්‌ ඉතා සූක්‌ෂම ආකාරයෙන් පුරා විද්‍යා උරුමයන් විනාශ කරන්න කටයුතු කරනවා. මේවන විට ඒ තත්වය උපරිම මට්‌ටමින් සිදුවෙමින් පවතිනවා.” සෝමරතන හිමියෝ කීහ. කිසිදු ඓතිහාසික සාක්‌ෂියක්‌ නොමැතිව මල් තිබෙන නිසා මුස්‌ලිම් අයෙකුගේ සුසානයක්‌ ඇතැයි කියන්නේ නම් පේරාදෙණිය මල් වත්තත් සොහොන් බිමකි. මල් වැවී ඇත්තේ සිමෙන්ති ගඩොලින් මැදි කොට ඇති ස්‌ථානයේ කොටසකය. එය බැලූ බැල්මට මෑතකදී සිටුවන ලද්දක්‌ බව පෙනෙන්නේය. වෙළ`දාමට ශූර මුස්‌ලිම් ජාතිකයන් ශෛලමය නිර්මාණ සහිත කලාකෘති කළ බවට ඓතිහාසික සාක්‌ෂි නොවේ. වසර දෙසීයක්‌ පමණ පැරණිබවට ඔවුන් පෙන්වන ගල් කණුද වසර සිය දහස්‌ ගණනක පැරණි නිර්මාණයන් බව පෙනේ. මේ ආක්‍රමණයේ අල-ජී ස්‌වරූපය තේරුම් ගැනීම පහසුය. වැඩිවන මුස්‌ලිම් ජනගහණයට ඉඩම් සොයා ගැනීම ස`දහා භාවිත වන ඉතා ප්‍රාථමික හා අසංස්‌කෘතික ක්‍රමය මෙයය. මුලින්ම කුඩා පල්ලියකි. අනතුරුව ඒ අවට ඉදිවන ගම්මානයකි. ලිපි ලේඛන ව්‍යාජය. මේ ආකාරයෙන් ව්‍යාජ ලිපි ලේඛන සපයමින් මේ වන විටත් අම්පාරේ නිත්ත හෙලගම්පුර සහ සීනි සමාගම විසින් ගොවීන්ට බෙදා දුන් උක්‌ ඉඩම්ද ජනපද වෙමින් ඇති අයුරු කාටවත් පෙනෙන්නේ නැත. මේ නොදියුණු මිනිස්‌සුන්ට රටේ පවතිsන නීති ගැන කිසි තැකීමක්‌ නැත. තණ භූමියක්‌ ලෙස වට්‌ට මඩුවේ පැවැති ඉඩම් ඔවුහු අනවසරයෙන් වගා කළහ. වගා කටයුතු තහනම් කරන ලද්දේ බරපතළ විරෝධතා පැන නැගි පසුය. නමුත් මීට දින කිහිපයකට ඉහතදී මේ පිරිස්‌ අක්‌කරපත්තුවේදී මාධ්‍ය සාකච්ඡාවක්‌ පැවැත්වූහ. ඔවුන් පවසා සිටියේ තමන් ඉදිරියේදී බලයෙන් හෝ එම ඉඩම් වල වගා කටයුතු කරන බවය. මේ මිනිසුන්ට නඩු නැතිවූයේ කෙසේ ද?. මුස්‌ලිම් ඇමතිවරු විල්පත්තුව වනසති. ඔවුන්ව ආදර්ශකොටගත් පිරිස්‌ රටේ නීතිය උල්ලංඝණය කරමින් ඉඩම් අත්පත් කරගනිති. පුරාවස්‌තු වනසති. අලුත් ඉතිහාසයක්‌ නිර්මාණය කරන්නට තනති. මේ අසංස්‌කෘතික සංහාරය ශිෂ්ට සම්පන්න මුසල්මානුවෙක්‌වත් ඉවසන්නේ නැත. එහෙත් අපේ ”ජාත්‍යන්තරවාදී ශිෂ්ටත්වය” අපව නපුංසකයන් කර ඇති අයුරු සිත් පාරවයි. Without attempting to prove north of the island country as ours, the constant reminder should be that not a square inch of SL land can be claimed as Tamil national land and the only Tamil national land claim must rest with ONLY in Tamil Nadu! Current criticism against SL Army taking over Tamil land is ludicrous and hollow. In any national country army can take over any land private or otherwise in security situations as a sovereign right. UNP MP Cyril Mathew – No wonder Head of 1983 Vesak festival !!! growing up I have always heard that Cyril Mathew was the major force behind the Riots. He done it because he was anger ??? from tn to work in their tobacco plantations. do that. Thanks very much for your article. So Elar (Eela Rajah) who had war with Dudugamu (Thudda Kaimu) is Bhuddist Sinhala king not Saiva Thamil king . what about Prince Vijaya ? He & his 400 mates are not kala Thonis ??? My brother earlier kalla thoni call latest kalla thonis call Kalla thonis likw We Jaffna Tamil call estates Tamil Kalla thoni / Vadakka thaiyan / Thodda Kaddam etc….. When you cal us kalla thoni than only We realised some thing wrong some where ???? SHENALI !! YOU ARE MY HISTORY PROFESSOR. VERY DISTURBING FACTS. WILL SRI LANKA EVER HAVE A REALLY BUDDHIST, MAN, POLITICIAN WITH AN ERECT SPINE ? ALL THESE PLACES WHERE THERE HAS BEEN VANDALISM AND KOVILS BUILT, THEY HAVE TO BE TAKEN BACK, PERIOD. NO WONDER SAMPANDUNG IS GETTING COCKY THESE DAYS, BECAUSE WE HAVE AN OVER-RIPE BANANA, AND A DECAYING WAMBOTTA LEADING THE COUNTRY. THIS DUNG HAS BEEN THE PROXY OF THE MEGOLOMANIAC, AND IS, CONTINUING THE DISASTER, FOR SRILANKA. HE HAS TO BE STOPPED IN HIS TRACTS. Thank you for highlighting that the original inhabitants of Sri Lanka were the Sinhalese who lived in all corners of the Island, including the North. With time, for various reasons the demography of the land may change, such as Colombo which now has a majority of Muslims and Tamils and one day the Sinhalese numbers may deplete to low levels like in Jaffna. This is quite ok, as long as such changes are not exploited by communalists to justify the creation of separate monoethnic regimes, like they are trying in the North, East and the hill country. This article reminds me of what a respectable elderly Tamil lady mentioned long ago, that wherever in the North, when one digs the ground to sink a well or lay a foundation, they almost always found ancient Sinhala Buddhist artefacts and ruins and how sad she was to see these remains being dug out and destroyed or thrown to the sea by Tamil separatists. Today has Wigneswaran got an answer to this type of uncivilised behaviour? 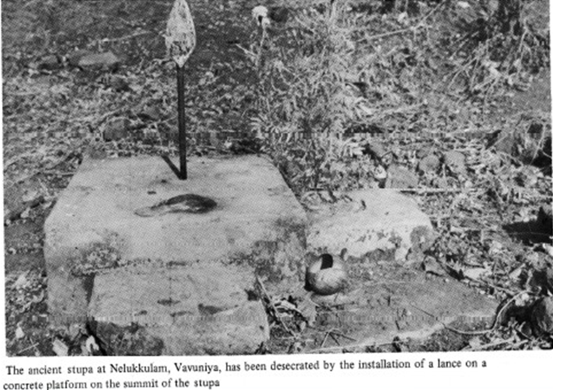 It was reported, during the communal riots under Mrs Sirimawo Bandaranayake’s regime, the Tamil separatists cut down the second Sri Mahabodhi sapling brought to Sri Lanka and planted in Trincomallee and then, to prevent it sprouting new shoots, they poured concrete over the root and built a Hindu Kovil on top of it, using much of the material from ancient Buddhist ruins. Can Wigneswaran comment on this uncivilised act, not second to the Thaliban destroying ancient Buddhist artefacts in Afganistan. In this article, I believe some pictures show Kadurugoda temple in Hunugama, (now Tamilised to Chunnakam). I request that knowledgeable patriotic journalists like Shenali should make it a policy to use the original Sinhala names and show the Tamilised name in brackets, rather than use the Tamilised names, which carries the wrong message to ignorant foreigners. This would go a long way to reveal the truth of Sinhala settlements in all corners of the nation, which is not known to well meaning foreigners, taken down the garden path by these separatists. When we use the original Sinhala names, every time in articles like this, it will reveal the truth and carry much more weight than if we focus only on debunking Tamil separatist fabrications. Yes we must also admire Cyril Mathews who had been unfairly slandered by racists, because he stood against unfair practices like cheating at examinations. It was well known how Tamil University examiners, who were the vast majority at the time, inflated the University entrance examination marks of Tamil students to help them to get in to Universities at the expense of other communities. It was the policy of the department of education to keep the marked examination answer scripts for a period of time, in case they needed to be re-examined. However, it was reported that truck loads of answer scripts were being sent to the Valaichena Paper Mills for pulping, before they could be re-scrutinised. This was discovered by Cyril Mathews and most of these trucks were turned back and answer scripts recovered. For this he was called a racist by the real racists. Our thanks to PATRIOTS for revealing the truth of matters in Lanka. Now the picture is quite clear. *. It is a fight by Separatists for LAND on a FOREVER basis. SEPARATISTS from any quarter are the problem here. * For this purpose, they use Tamil CASTE problems to de-stabiles the North. Cold War players aid and abet one way or another. * After the JVP was tamed, the method used by Yahap appears to be to impoverish the South and so de-stabilise the South. The bottom line is to de-stabilise and grab LAND & POLITICAL POWER, hook or by crook. Good and informative article Shenali. Thank you. All Sri Lankans should use the Sinhala names for the various locations in the north and east, which have now been tamilized. Dr. Chandre Dharmawardana has compiled a list in his place names site http://dh-web.org/place.names/. At least, the Sinhala writers must make an attempt to use the original place names. SA Kumar, Cyril Mathew did not start TAMIL riots it was started by PRAMADASE’S his wife, and his Hench man. This is a well known fact. Dear Dham, What Muslims are doing at the moment is irrelevant. Indian imperialists are the ones who are behind driving a wedge between Sinhala Buddhists and Sinhala Muslims and Sinhala Christians. Similar articles are part of those schemes. ‘growing up I have always heard that Cyril Mathew was the major force behind the Riots. My apologies, I was not quite clear in what I had written. What i meant to say is that in light of what is in the article above, I also question this popular belief of Cyril Mathew directly being blamed for the riots. I was agreeing with what Dilrook had written, but did not write in a clear enough way to convey what I had in mind. My Sinhala brother who was master mind of 1983 festival is open Secret. pass is pass We all make mistake We both paid higher price for it since 1948 to 2009 !!! live & let’s live in United Mother Lanka for ever !!! Fully implement 6A & 13A together . Settle 100,000 Bhuddist family in Vanni & bring Maha vali /Kalu Gangai to Iranamadu Kulam together. let me go back to our Tamilar 2,000 years day dream ” Naalai pirakkum TE (Tomorow TW will born) . Cyril Mathew tod the truth. He did not intend to achieve anything. Riots were started by LTTE. All other statements are lies. Don’t live and let live on lies. You will pay by great suffering in the next birth. Hell is waiting for you. who gave voting list to riots & refused to impose curfew for a week not VP & co.
You will pay by great suffering in the next birth. Hell is waiting for you.- Let Lord Bhudda or God Siva do their job but can We live & le’s live while We both community in Sinhala Lanka ( Chignkala Theevu). Why this kolaveri machang ??? it was started by PRAMADASE’S his wife, and his Hench man.- partly agreed where my father was living (Colombo 10). but t also JRJ’S 3 Minsters directly involved you know who they are ??? forget & forgive mate not worth analysing our madness . live & let’s live . Thalaiva Velu where are you ? This entry was posted on Tuesday, April 26th, 2016. You can follow any responses to this entry through the RSS 2.0 feed. You can skip to the end and leave a response.